The website for the book is here. Perhaps more than any major book published so far on the capacities of and challenges to Internet free speech, MacKinnon’s opus lays out how the Internet can be reworked by authoritarian governments and complicit companies into an instrumentality of social and political conformity. I’ve noticed this paradigm shift myself as the Web 2.0 (and beyond) world evolved, taking the Web (in the broadest sense of the word) out of the world of simple self-broadcast and passive networking. She starts her book by talking about the rather well-known problems overseas, explaining how China maintains a façade of “democratic” openness while strictly monitoring and stifling political criticism. It isn’t long, however, before she gets into the existential issues facing users in the West. One of her strongest points, made early on, concerns the way the US government and supposedly liberal Obama administration jumped on the Wikileaks problem, jawboning major companies (credit card processors and PayPal, Amazon and various Internet hosting companies) into stopping doing business with Julian Assange, she makes the point that private companies can feel pressured to drop clients whose controversial content or actions could bring them risk. This has been a concern ever since 9/11. I could add something here: when attempts have been made to offers bloggers liability insurance, companies have balked at customers who write about controversial topics, including LGBT issues. The behavior of people who generate content under a “free entry” system has indeed created risks for others, ranging from cyberbullying, reputational damage (sometimes short of legal defamation), targeting, and (in the copyright area) piracy. She explains well, in several places, the problem of expecting “intermediary liability” (or “downstream liability”, as I’ve usually called it), trying to hold providers like YouTube responsible for pre-screening possibly libelous or inciteful content, or for copyright infringement. Section 230 and DMCA Safe Harbor both protect providers from downstream liability (for different problems) and effective remove what would be a big “barrier to entry” for small speakers. Nevertheless, the permissive environment allows others (often less well off to start with and less savvy) to be put at risk by the impetuous actions of others. She discusses the Senate’s proposed Protect-IP Act (or PIPA). The book was written before the House version, called SOPA, and well before the Wikipedia-led one day blackout in January. She says that even current law allows Customs (ICE) to seize domains even for linking to piracy sites (without hosting the pirated content itself); I was surprised to see this. Another issue is the “ideology” or perhaps business model of the newer social networking companies, especially Facebook, which has been determined to follow a policy of requiring users to have use one true legally recognized identity. Facebook has sometimes caught dissidents flatfooted with sudden changes that could expose dissidents overseas. There was hope that Google+ would be more flexible, and maybe it has somewhat, but even this service by and large insists on using true identity. She also discusses a case where Apple withdrew an application because it promoted ex-gay groups. She says that she personally disagrees with what the app tries to say, but that companies should not interfere with speech even though they have a First Amendment right to do so. Since these companies are so dominant, it puts their management, or in the case of Facebook, founders, in the position of “ruling the world” based not only on business models but personal belief systems. An extraterrestrial suddenly falling to Earth would probably want to meet Mark Zuckerberg before bothering with the president or any of the candidates. The president’s summit meeting in mid 2011 with Silicon Valley executives (including Zuckerberg) was probably motivated in part by concern over how their sites could affect protest movements overseas (as well as be misused, for example, by flash mobs). Toward the end, the author discusses the politics of the domain name system, with the many trademark issues, which an squash small fry. ICANN has a loose connection with the US Commerce Department, and this causes some political problems with the rest of the world. Were ICANN to come under more foreign influence, there could be consequences for US speakers. She also explains how “Internet Freedom” is a loaded term, and closes with a discussion of “personal responsibility” on the part of netizens, with a discussion of the case of Ali Weiwei in China. Here is a YouTube video of Mackinnon’s address at the New America NYC. The discoveries are presented in random order as to chronology, giving the reader a sense of “time travel”. A few, such as nanomedicine, terraforming (with a compelling illustration of Mars after ecopoiesis), and augmented reality, are seen as ongoing and don’t have dates. One of the oldest is the abacus (3000 bc), or the wheel (3500 BC, which the Maya did not use in this hemisphere). Some discoveries appeared surprisingly early, such as electricity in 1745. The discoveries are organized into four groups: (1) The Power of Informaiton; (2) Engineering the Body; (3) Invisible Forces; (4) This World and Others. 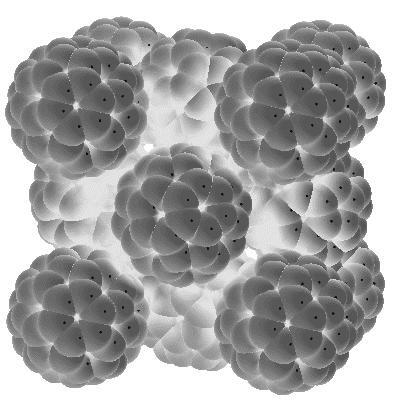 One of the most curious is the Bucbyball (p. 13, named after Buckminster Fuller). The novel “Sandstorm” by James Rollins (link) (aka Jim Czajkowski), 2004 (Avon/Harper Collins) uses the concept of buckyballs (drawings pp 484-486 in paperback) as party of the plot denouement (he also gets into antimatter and the CERN collider). The novel (which I read in 2005, sometimes on sub teaching assignments while the kids did their classwork!) would obviously translate well to a genre Hollywood thriller (or maybe even a cable television series), but I don't see it on imdb. I see two other (post 2004) movies with this title that seem unrelated. I'm actually surprised it hasn't been "made" yet. Michio Kaku on the cheapest way to terraform Mars: Use “global” warming! Wikipedia attribution link for drawing of fullerite.